Sugar cane juice and brown sugar sweetness, with top notes of fine black and green teas, lemon juice, brisk apple, and cardamom spice. Gitesi's finish is so sweet and pristine. The Gitesi site is at 1740 meters, actually one of the lower areas surrounded by high ridges ranging up to 2000 meters, where coffee is grown. 1,830 coffee farmers in the area supply Gitesi with cherries each year. The station fosters a relationship with the farmers by paying an additional dividend at the end of each season based on performance. Gitesi was started in 2005 and has been building capacity each year. 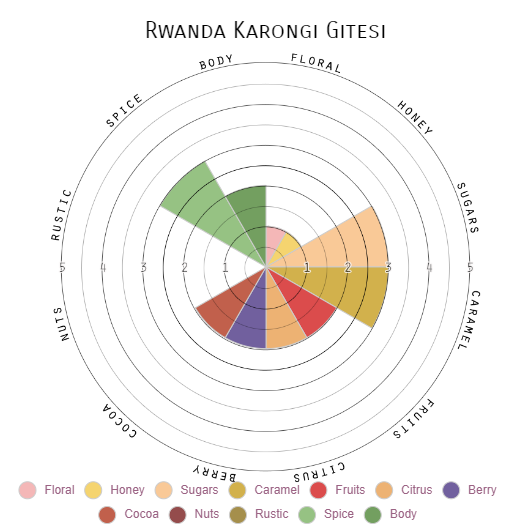 Like much of Rwanda, the coffee is Bourbon variety. This coffee cherry is wet-processed and machine pulped before air drying.